All of the build-up and kick-by-kick coverage of tonight's tie at Anfield. Can the Blues turn over the Premier League giants? Asamoah tucks a low drive under Bogdan in front of the Kop. Game on. I've never tried so hard not to celebrate in my life. 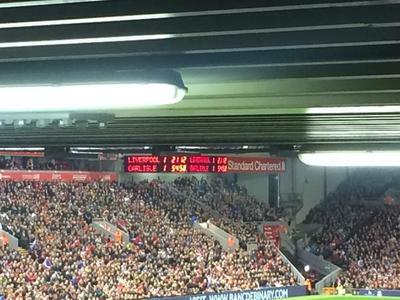 #LFC 1-1 #cufc . @joncolman @newsandstar @Skagsy Come on Carlisle, super blues???????????????????????????????????????????????? Sky cutting short Asamoah's celebration just as it was getting interesting. HALF-TIME: #LFC 1-1 #cufc . As finely poised as a game can possibly be. Sure we'll see Jabo at some point. Ok, time for a brew. Where did I put that pie. HALF-TIME: #LFC 1-1 #cufc . Asamoah levels the tie after Ings' opener. Big second half on the way. Sure Jabo will be deployed at some point. I predict someone at N&S HQ will send out for pizzas. 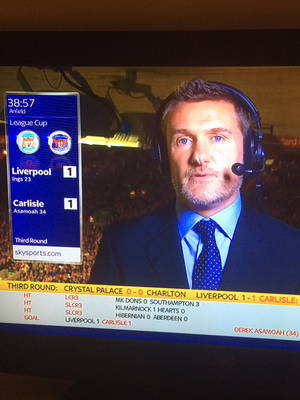 Dare I say, Andy Hinchcliffe a little less Premier League smug so far in second half. Click on Jon Colman's online match report to see pictures of Derek Asamoah's goal celebrations. It's been all #LFC this half. Sense the home fans are getting a little restless. Liverpool 1-1 #cufc , 62 minutes gone. #Jabo Ibehre is being readied for #cufc . His name is being sung loudly by the travelling fans in the Anfield Road End. Alex Gilliead, on loan from #NUFC , is on along with Ibehre in place of Derek Asamoah and Antony Sweeney. Less than half-an-hour remaining. 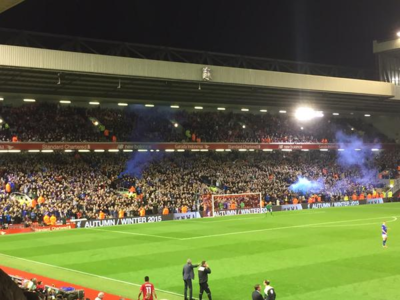 Can #LFC (or even #CUFC) find a winner? Curle's going for the win. Ibehre and Gilliead replace Sweeney and Asamoah. But so is Rodgers. Coutinho replaces Allen. ...and #LFC have now deployed Philippe Coutinho. 65 minutes played, 1-1. Jabo v Coutinho...who can be a match winner? Coutinho warms Gillespie's gloves. Keeper beats away the shot. Gillesphey coming on for his Carlisle debut, Kennedy replaced. #cufc loanee Macaulay Gillesphey is on in place of Jason Kennedy. Some place to make your debut. 72 minutes, 1-1.